Researching my family tree, as I periodically do, I recently became acquainted with a distant cousin (3rd Cousin, once removed, to be exact) who shared the little gem at right, lifted from the pages of The Somerset Herald, dated September 29, 1897. After a bit more research, I learned that 21 year-old William Amos Troutman, along with his half-brother, Henry, 17, were arrested in Mt. 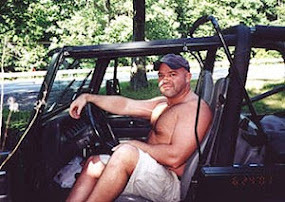 Savage, MD, charged with carrying concealed weapons. On their persons were two revolvers, three razors, two bicycles, and $45. No report on why they were initially picked up or otherwise stopped by the police. 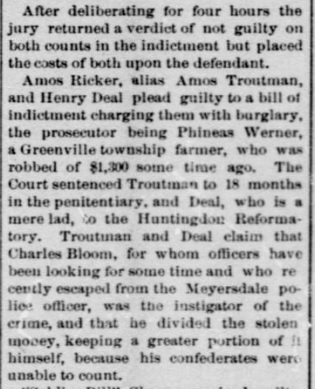 The men confessed to robbing Mr. Phineas Werner, a farmer from Somerset County, of $1,300 (today's equivalent of about $28,000, adding in inflation) which he left in a bureau drawer while "he was out picking berries". Werner could identify the money as some of it was in paper which he had saved from the war. The robbery occurred on August 6, 1897. There's no more mention of Charles Bloom and no record of exactly how much money each man took in the take. Now, one might wonder on what - in 1897 - two boys who could neither read nor write spend a lot of money. They certainly didn't invest it, as Amos was fairly poor his entire life. 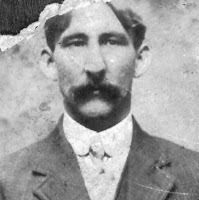 He was 21 at the time of the arrest and if he spent all 18 months of his sentence in the penitentiary, he would have been almost 23 by the time he got out in March 1899. I searched the 1900 Census and couldn't find him, so there's no telling where Amos was or what he was doing. The next account of him is on the 1910 Census, which shows he was married to my Great-Grandmother, Cecelia Winebrenner, for two years. The census states that they were living in a home at 67 Foundry Row in Mt Savage, MD, that was owned by Amos and was free of mortgage. It's possible he saved the money for that, however, not probable. My guess is that Amos spent the money on the photograph below, including the shirt, tie, suit, shave and haircut to go along with it. I had always wondered why an illiterate farm boy would need a professional photograph of himself. But it seems clear that he now had the funds to do it.